Three reasons to choose Watson's Painting & Waterproofing Company for Drywall Repair. 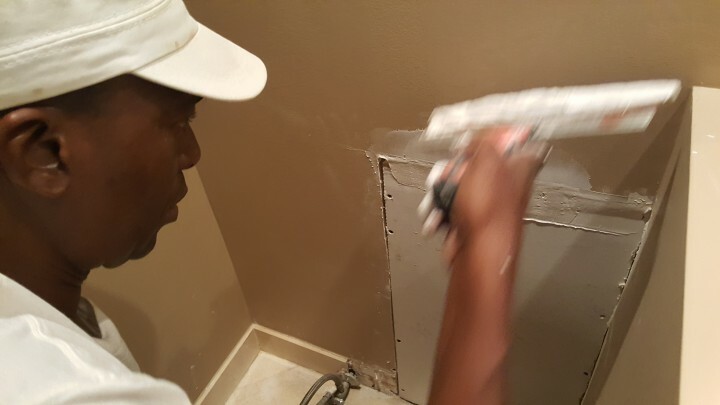 Skill - Since 1996, homeowners and business have called Watson's Painting & Waterproofing Company to repair drywall. Whether replacing yards of damaged wall or filling in a small hole, we are ready. Watson's Painting & Waterproofing Company's repairmen are skilled in sheetrock, plaster, and stucco repair. Price - Watson's Painting & Waterproofing Company's drywall repair is always affordably priced and we guarantee great value. Call now for a fast free quote on Watson's Painting & Waterproofing Company's drywall repair service. Warranty - Watson's Painting & Waterproofing Company guarantees your drywall repair will be done professionally without corner cutting. We job will do the repair to your specification and we'll make sure you are pleased with your repaired drywall. And we'll even match the paint so that you'll never know that the wall was ever damaged in the first place! Watson's Painting & Waterproofing Company is happy to provide Drywall Repair services. Whether fixing a crack or redoing the an entire home or building, no job is too big or too small. Our expert craftsman have years of experience and can make your house or office look new again. We happily fill in nicks, dents and small holes, and professionally install drywall for large repairs.